Bella is a Pointer Lab — a mixed breed, a bit of a mongrel, best of both breeds I am sure — who was rescued at the insistence of The Perfect Daughter. TPD is the kind of child who staffs the family up with dogs and then takes off for NYC where she is forbidden to have a dog and thus The Boss is left with the dogs. 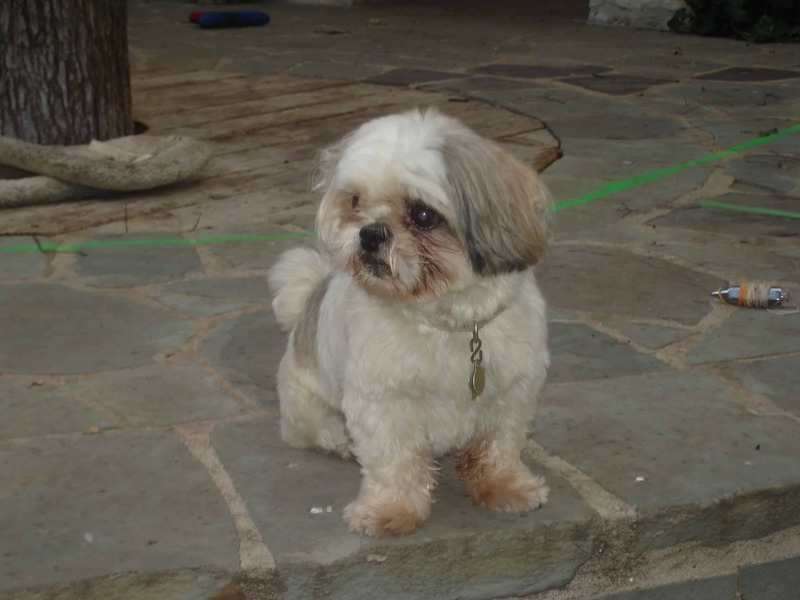 Rufus, the Shih Tzu, met an untimely end and is buried under The Perfect Daughter’s windows. You can read about it all here. Sad time but everyone has now gotten over it and the Legend of Rufus the Shih Tzu is now part of the family lore. It is sad but happy in an odd way. I think Bella misses Rufie. Rufie was the brains of the family. The Boss particularly misses him at tax time as Rufie used to do the family’s taxes. Bella is a very sweet dog as long as you are not a Texas whitetail deer. If you are, Bella will chase you until her heart explodes. 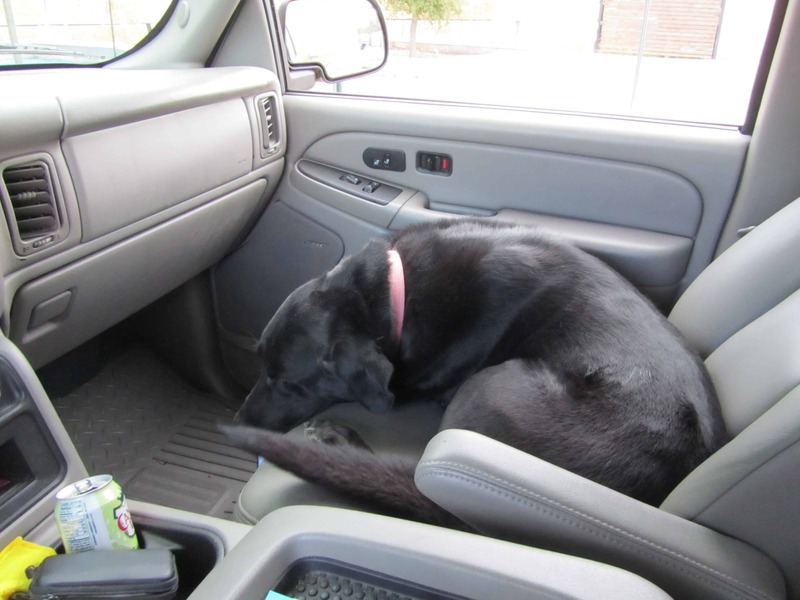 When you travel with Bella, she rides “girlfriend” — can only be done in a Southern or Western pickup truck for purists — which means she is right front in the pickup truck and from time to time will lean over and nuzzle and kiss you. A cold nose and a very big wet tongue on a hot day is a wonderful thing. If you provide any encouragement at all, like rubbing her ears, she will implore you with those big paws and nails to continue your ministrations. Her claws are as big as a black bear. A small black bear but big nonetheless. Yesterday, the deer were all over the golf course. Golf course on one side and lake on the other. Bella chased some deer and came back for a swim and then lounged around while The Boss was doing his work. On the way home — windows down, glorious sun pouring in, 75F and cloudy, spitting a bit of rain — Bella passed the golf course which was lousy with deer including a couple of very nice bucks. Bella feigned disinterest with a show of aloofness. Well, until she came abreast of a huge buck and then she launched herself through the pickup window and took off chasing the buck across the golf course. The Boss just circled the golf course — only nine holes — and then Bella reappeared as if she had been out for a stroll. She can’t quite leap back into the pickup window though she did try. Back into the pickup and she sleeps on the way home undoubtedly dreaming of those deer at Blue Lake. This is the time of year that Texas is just the most enjoyable place in the world to live. Cool, crisp, sunny and lots of things to do. We will have 3-4 days of winter here soon and then back to this boring, glorious weather for a few months more. If you are very lucky, you will be able to hang out with a Black Lab and chase deer at the lake. You may want to let the Lab do the chasing but it really is up to you, Old Sport. You can drive your pickup around with the windows down, Willie & Pat Green on the radio, your girlfriend alongside of you and thoughts of BBQ on your mind. Hell, you can even go eat some damn BBQ. Why not? Can life get better than this? I think not. By way of full disclosure, though I write of the pleasure of a pick up, the Big Red Car draws the assignment from time to time to make the trip out to the lake. On a cold morning, top down, heater blasting, windows up, sweaters on and Bella in the back seat. I like that dog. She’s a lot of fun. Here’s to Black Labs and Texas and pickup trucks. On Earth as it is in Texas, ya’ll. Come on down and move here. We’re waiting on you. But, hey, what the Hell do I really know anyway? I’m just a Big Red Car. Be kind to a Black Lab today. 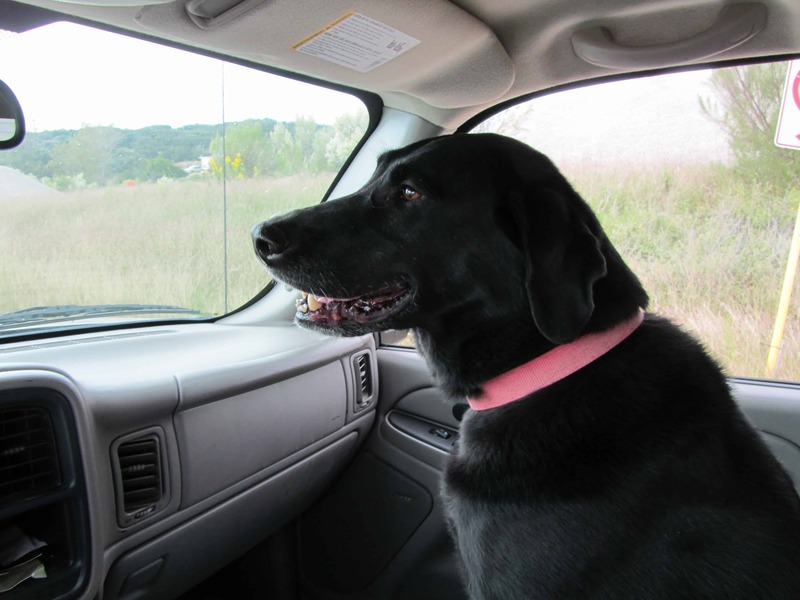 This entry was posted in Texas, Texas the ATX and tagged Austin Texas, black labs, Texas. Bookmark the permalink. we have our first black lab after four yellow ones over the last 30+ years–Max is a rescue dog from our county animal shelter and is also a mixed breed–we think German shorthair. No one knows, of course, and Max is keeping mum. Lovely dog, but first lab we’ve ever had who does not like to swim. Thanks for the encomum on great dogs. Hey, Mike. Thanks for the comment. Don’t let Max get away with the silent treatment. Get a little whiskey into him and that’ll loosen his tongue. PX and Caroline were here in the ATX for a visit. We had a grand old time. The Boss and X roomed together at EOBC over 40 years ago. Bella is not a great swimmer. Her predecessor, Texas Pete, was a thoroughbred and was a mad swimmer. The Boss used to launch a ball almost across Town Lake and Petie would go retrieve it for swim of probably 200′ + in each direction. Petie ran into some swans mid-river and tried to make friends as Labs are wont to do. They were not charm school grads and Petie escaped with his life. Encomum or encomium? I hate to have a CE correct an English major. But it does puff up one’s ego from time to time. Quite right! I am usually a good speller but was certainly a lousy typist when I posted this.Teaching English to developmental students has warped my skills. I used to teach technical writing to engineering graduate students at Southern Illinois University–they were, as a rule, far better writers than the occasional English education major (the folks who will become middle and HS English teachers) who took the course. CEs are almost alwasy careful writers. My two previous labs, both yellow and littermates, were constant swimmers–they would break ice to get into the water when we were stationed at West Point–this one fell into our pool one day and i had to turn him over and lead him out via the steps. Very different from the others we’ve had–but I do not have to fool with the chemicals as much–dog hairs really affect the Ph! Glad you and the English family got together–probably the highlight of this year was our attending our 40th–we took Hugh White along, who flew from CA to STL to drive with us–I told Caroline I had never seen someone look as serene as her. They are the very best advertisement for a VMI education. How did anyone exist before spell check, no? I am a wizard fast typist having learned when I was a kid. I got a job as a Gen’s aide because of my typing. Short story. Labs are the best. We’ve had two and if I lived out at the lake, I would have a fire team at least. They are such wonderful companions and so cheerful. I had a great visit with X and Caroline. We made the tour of the town. As I said X and I roomed together at EOBC and had not seen each other in a long, long time. He had a most impressive career building power plants all over the world. As a CE, I am envious. That is real engineering. The longer I am out of VMI, the more I appreciate the education and training and my Brother Rats. I would take the integrity of the lowest grad of our class before most men I have known. pointer lab, now there is a breed. usually they are flushers. The fastest dog I have ever seen. That’s a mighty fine lab and a great deer story, BRC. Glad there are no gators in that pond. No gators in central Texas. Thank goodness. BRC you just brightened up my day!